Donita Mudd’s contracting company, Lapsley, Inc., Window Treatment Solutions, installs intelligent window treatment, the catchall term for blinds, shades, draperies, and, even, projection screens, that require electricity and adorn the windows of corporations and institutions. For one job, Mudd was responsible for installing 2,200 blinds in Indianapolis, and another job required window treating for a 21-story building. Her customer base is almost all corporate, a lot of it is federal, and almost none of it is residential. When the company she worked for downsized back in 2001, Mudd hustled some side gigs -- what you would call usual sewing – until inspiration, through the grace of God, she said, hit her and she relied on the familiar. Both of her previous jobs sold products to corporate and federal clients, both across the country and world. Mudd worked in marketing so she already knew the secret handshake to become embedded. She launched Lapsley Window Treatment Solutions officially in 2003. Nationally, and most impressively, Mudd has treated windows at the FBI building in D.C., the Claire Barton House in Maryland, the U.S. Department of Treasury building in Birmingham, Alabama. Regionally, she’s worked for Valparaiso University, at the new Neurological Diagnostic Institute for the East Side of Indianapolis, a renovation for a Volkswagen building in Mishawaka, and the South Bend Public Library. 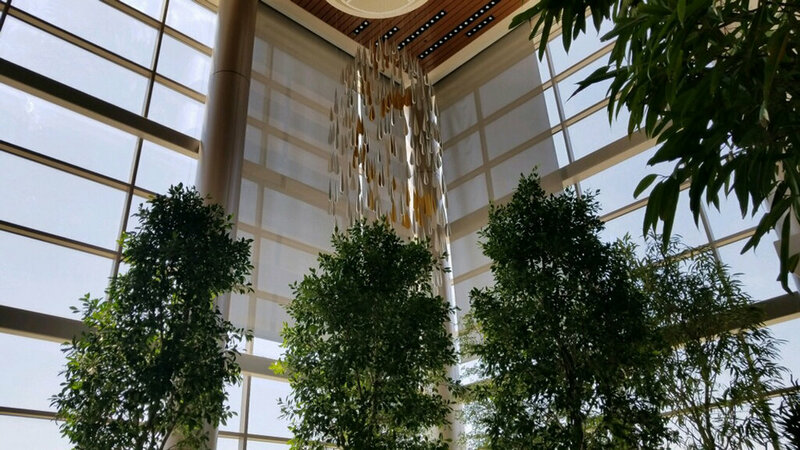 If you’ve been to a newly constructed big building in Fort Wayne, you’ve already stepped into one of her buildings, like the Parkview Cancer Institute off of Dupont Road. She has accomplished all of this from the friendly confines of her basement home office, with a phone line, the Internet, the Excel program, and a white board that displays all of her jobs and her current bids for new work. “Now you have to have lowest number,” Mudd said of the competitive bidding. It took a couple of years before Mudd settled into her reputation. She still retained her multiple hustles; one time she needed to get paid by her side job so she could pay her employee to hang blinds at McCormick Apartments, for the Fort Wayne Housing Authority. Blueprints for a commercial job site might be over 100 pages long and the cost to print topped over $100…this is before the job is guaranteed. A hospital window in the waiting room might be different than those installed outside of patient rooms. But winning a bid comes down to the lowest cost. “You have to be cognizant of what the competition does,” she said. And as a contractor, Mudd has to weigh the cost of going with a preferred manufacturer that sells material easy to install but may cost more. Clients don’t care about those kinds of particulars, like not overworking her employees who never intended but found themselves working on a Saturday. Mudd’s mother and father had a drapery workroom in the early 1970s. He installed, and she sewed; most of their work was residential. “I just remember [my mom] pushing that fabric under the sewing machine. I said I’m not doing that.” But she did learn to sew. She attended Central High School for a semester, before a family move to a new school district forced Mudd to attend and graduate from New Haven High, then graduated from Purdue University in West Lafayette with a business degree. Mudd has had to learn, through reading and research about wood density and screw options, to be competitive in the new world order of remote control-controlled blinds. “You have to be able to move where the technology moves,” she said.